Even if the colors don't look accurate in the pictures, those nails still look completely awesome!! This is really good Rebecca! I can really relate to not wanting to take 100,000 pictures! Much less ten times that! love the colors, very cute! Love this manicure! The combination of purple + green is so striking. Also: I'm terrible for abusing the "ERMAHGERD" meme. I've been doing it a lot lately. Random example: at the grocery store, sees display of fall gourds... "ERMAHGOURD". I'm a dork. I love this!!! One of my pinterest boards is dedicated entirely to the ERMAGERD memes. The colors look great together! I 've always wanted to try a "dripping" design, too. Yours looks great. I love love love it! The lid on that polish is too cute! Wow this is great! I love the colors! Everytime a new "Ermahgerd" meme comes out, someone send it to me because I just DIE every single time. I have about 28709875 of them on Pinterest. Great job! I love it! And haha, yes, I love that meme too :D Even if I sort of feel guilty in a way for laughing at it. This is so awesome! 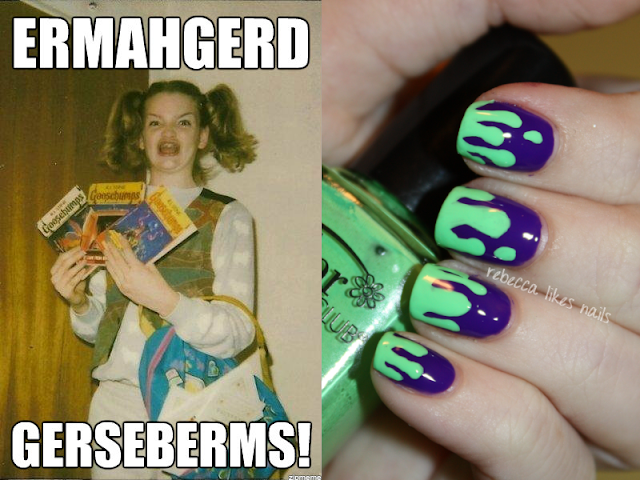 I am obsessed with the ermahgerd meme too, I don't think it will ever get old. I absolutely love these! I was obsessed with Goosebumps as a kid, and that meme always makes me laugh :] Great post! i love this mani! those colors are perfect. and i really love that pride polish! awesome! Wow. I love these so much! Especially the colour combo!